Our Portland Audubon Birdathon team visited the Spring Creek area of Wallowa-Whitman National Forest (Birding Oregon p. 47). This area is best known for Great Gray Owls, but other good birds are found here, as well. 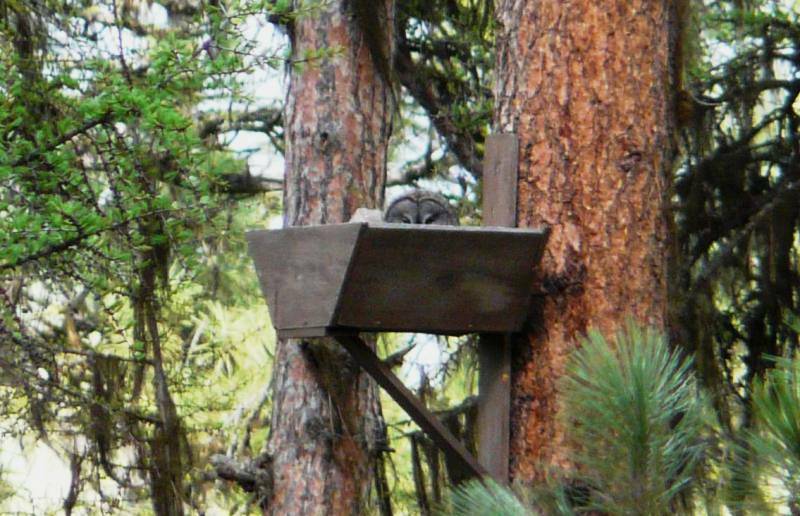 The owls nest on platforms provided by the Forest Service. This helps the birds to nest successfully, and makes it easier for birders to find this rather elusive species. This individual seemed pretty comfy on her platform. This entry was posted in OR Birding Sites and tagged Great Gray Owl. Bookmark the permalink. I love it! Sounds like you had a productive trip! is the nesting info in your book???? Spring Creek is described in Birding Oregon (p. 49). Since the nest sites change year to year, contact the Forest Service for a map of active nests. That contact info is on the same page.